​In this landmark work of Islamic literature, Allama Shibli Nomani tells the epic story of Omar R.A. "The Great", the second Caliph of Islam. Regarded as the architect of the Islamic empire, Omar R.A. established a model political structure that would hold together the growing empire for centuries. Allama Nomani delves into Omar R.A.'s reputation as one of history's great conquerors and political geniuses, while also examining his pious and just nature, which earned him the title Al-Farooq ("the one who distinguishes between right and wrong"). Under Omar R.A.'s leadership, the empire expanded at an unprecedented rate ruling the whole Sassanid Persian Empire and more than two thirds of the Eastern Roman Empire. As a leader, Omar R.A. was known for his simple, austere lifestyle. Rather than adopt the pomp and display affected by the rulers of the time, he continued to live much as he had when Muslims were poor and persecuted. 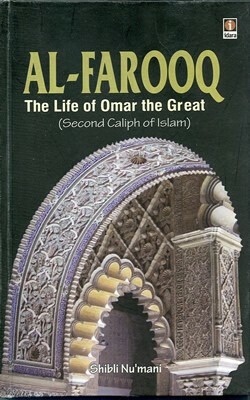 The book consists of two parts: the first deals the events embracing the lifetime of Omar R.A. as well as his political achievements, while the second is a detailed examination of his system of government, both political and ecclesiastical, as well as his intellectual attainments, personal virtues and habits. Author and renowned Islamic scholar Allama Shibli Nomani undertook an extensive study of the subject through several years of research in many of the great libraries of the day, including Istanbul, Beirut, Alexandria, Paris, Berlin and London. The result is what many consider to be the definitive biography of Omar R.A. "The Great".